Why do so many engaged couples look at Charleston, South Carolina as their favorite city to get married at? Simple, when you have a well preserved historic city, filled with many southern plantations, beaches, and amazing wedding venues to include art deco hotels, including taking into consideration how your family and guest can enjoy it all, is why we are the second largest destination wedding city choice by many future couples on the east coast. Wedding photography for me is an art form, my goal is to have proper lighting skill for any wedding images and the craft and composition that is taken to make a compelling wedding image.This image, in particular, is a perfect example of what Our Holy City means to me. From the steeple to the bride praying, the image is complete, this is really mastering your craft. 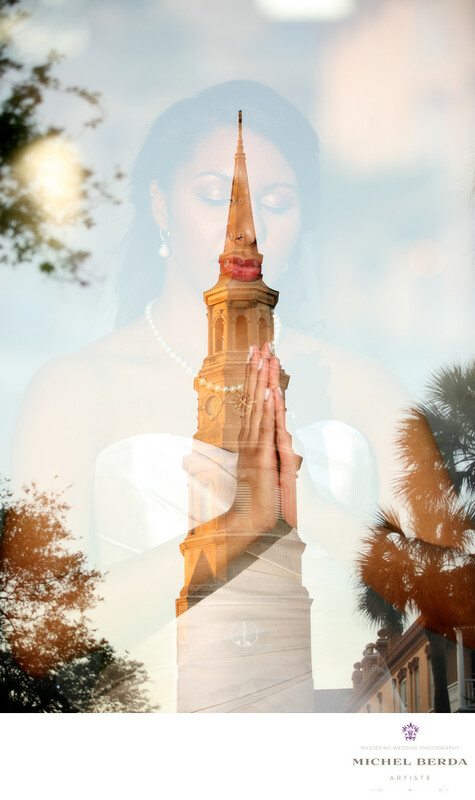 You give your wedding clients the images that they never expect, you surprise them with your out of the box imagination by producing an image like no other Charleston, SC wedding photographers.Keywords: Charleston (1179), charleston wedding photographers (15), king street photo weddings (219), Michel Berda (1140), photographer (1125), Wedding Photographer (1254), Weddings (168).